As more professionals and services move online, there have been some interesting developments in the legal world, including divorce websites such as Wevorce, LegalZoom, LawDepot, iDivorceForms, and CompleteCase.Com. All offer to guide customers (with a fee) through the paperwork involved in a divorce—without the help of an attorney. If you’re getting a divorce, you need to know if the promises of a lawyer-free divorce are valid and when it’s better to have a lawyer on your side. Is Divorce Possible Without an Attorney? The answer is yes. While there are many different rules and laws that may apply, and it is unlikely that someone who has never been through a divorce will be familiar with the peculiarities of the legal system, it is entirely possible to file for divorce yourself. However, it will take time, effort, and research to make sure that you accomplish it correctly. Divorce websites can help. What these websites claim to offer is a shortcut—in the form of a paid service that will walk you through all of the necessary paperwork and procedures to ensure a successful legal divorce. What they don’t offer, however, is any kind of legal advice or support, particularly if the divorce isn’t amicable. If you and your ex-partner are able to manage your split peacefully and come to an agreement about how to divide your assets, how to divide jointly owned real estate, businesses, or other property, and how custody of your children will be managed, then this kind of shortcut may be something to consider. You may even be able to save time and money. If your divorce involves jointly owned, high-value assets like homes or real estate, businesses, investment accounts, a lot of cash, or other assets, you should definitely consider consulting with an attorney to ensure that all of your assets are divided appropriately. Many people are surprised to learn about assets they assumed belonged to their ex-spouse were actually community property, and they were due a share; others are surprised to find out their ex-spouse has other assets. Children and custody issues also make seeking legal help important. Courts will typically look much closer at a divorce case to make sure that any children involved are taken care of appropriately. If there are any questions or issues about who will care for a child, an attorney can help you negotiate a parenting or child custody agreement. A major downside to online divorce is that the moment things get rough, web-based divorce companies don’t really help you. These sites are guides to the paperwork and procedures, but the moment things start to get complicated, they will charge you more money, and costs can start climbing fast—yet you still won’t have the benefit of an actual attorney to help you. It’s also important to realize that even if you file for an online divorce, you may still be required to put in a court appearance. A judge may want to speak to you and your spouse to clear up any questions about your filing, particularly if there are children and custody issues in question. If a company is promising you a court-free divorce, think twice about giving that company your money. 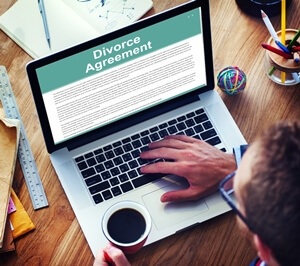 If you think your divorce is going to be easy with no assets or child custody issues, maybe it’s worth your time to research what an online divorce can do for you. However, most often, speaking to an attorney will net you better results. It may not be as cheap as what’s promised by online websites, but you’re likely to be happier with the outcome, especially if your divorce has more at stake. An attorney will also know the laws specific to your location—a one-size-fits-all website may not. And in addition to filing the paperwork for you, an attorney may offer legal advice, assist you with asset division, be with you in court, and help connect you with any post-divorce resources you may need to get back on your feet. The Law Offices of Molly B. Kenny offers assistance with family law and divorce issues for couples of all kinds, and we would like to be there for you, too. To arrange a private consultation in our Bellevue law office, call us today.